The end of March marks the arrival of the spring. The blooming flowers are staples of the season, and their colors inspire creativity. 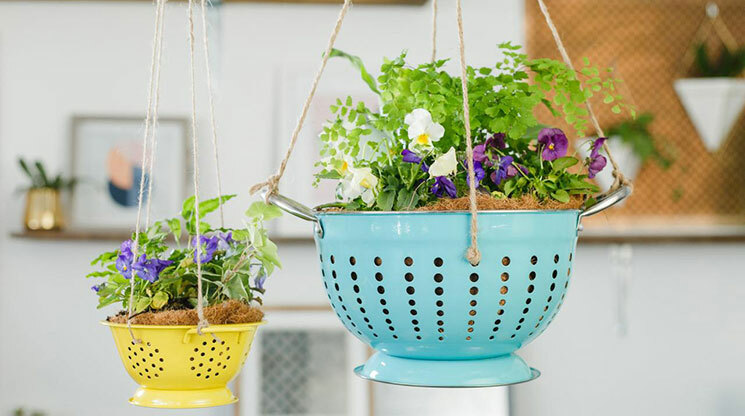 Celebrate spring by crafting one of these simple handmade items in your spare time. Wrap one handle of a colander tightly with a half-yard of twine, pushing pieces together as you go to avoid gaps between the strands. Once the handle is covered, tie off and add a small amount of glue to secure it. Repeat entire process with opposite handle. Make sure to knot a yard of twine at each end of the handle. Line the colander with sheet moss and fill it with potting soil and seasonal plants of your choice. Tie four lengths of twine together (two from each handle) and hang the planter up. Sort your stones by size. Try to get stones that can stand up straight so they look natural. Paint one stone white for the parent, and paint the rest yellow for the little ducks. Let them dry for a half hour or so. Once dry, touch up the spots where the stones were resting so they are all completely covered. Apply varnish if you used regular paint. Once dry, add tiny eyes with the black paint and a line of red paint for the beak. Cut four containers out of the egg carton. Trim around the edges so that it gives it a rounder shape for the petals of the flower. Squirt some acrylic paint colors onto a paper plate, and use it to paint the inside of the containers. Use any colors you’d like. After the paint is dry, attach the stem of the flower by gluing it to the back. Use a paper straw for this, because it’s thick enough to hold the cartons. Next choose a colored cotton ball and glue it to the center of the painted egg carton. Wrap the embroidery hoop in washi tape. Wrap the tape around until the plain hoop is covered with your color of choice. Clear the leaves from the stems of your flowers, then trim each stem to about 4 inches from where the blooms end. Thread a needle with clear thread. Insert the needle through the end of the first stem. Pull the thread all the way through. Tie the thread around the embroidery hoop so the flower hangs just below the hoop. Secure with a double knot and trim the ends. Continue in this way until you’ve tied a good amount of stems to the hoop. Cut three long pieces of clear thread and tie them around the hoop equidistant from each other so the hoop is supported at three points. Bring the three pieces together at the top and tie them to the metal ring or clip. Be sure that the hoop of flowers stays level so the chandelier hangs evenly.